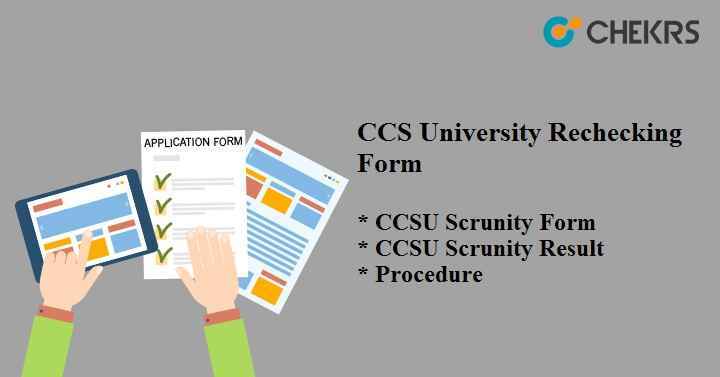 CCS University Rechecking Form 2019: Those candidates obtained the result of the CCSU and not satisfied with their marks obtained by them can apply for the CCSU Scrutiny Form. The applicant can fill the CCS University Revaluation Form on the official website. Latest Update: Access CCSU Grievance and Rechecking form, from the link given below in the Procedure. The applicant can fill the scrutiny form 10-15 days after the declaration of the result. Some of the applicants doesn’t know the process to fill the form, so for simplifying their problem, we are providing here the detail regarding the CCS University Revaluation Result 2019. Some of the applicants don’t know the process to fill the revaluation form. So we are providing here the steps for checking the CCSU Reval Result. On the opening of the official website, there is examination section appear on the screen. Click on the A new window will open, applicant require to select the course of which they want to see the result. On selecting the course the CCSU Reval Result appears on the screen. The applicant can take the print out of the revaluation form for the future reference. Chaudhary Charan Singh University is also known as Meerut University, it is a public state university located in Meerut, Uttar Pradesh, India. The university is established in the year 1965. The university is sponsored with 22 UGC and 35 self-financed/job oriented. The university having various schools of studies via. sciences, Humanities and Social Science. In this article we have talked about the CCS University Rechecking, Rechecking Dates, Form and procedure to fill the form. The information provided here is as per the official notification. The Information can be changed respected to the university plan. So visit our site regularly and subscribe the news letter, so you will not miss anything. Still if the applicant has any queries they can contact us through the comment box. i am student of LLB but i am not happy with my fifth sem result 2018 .
so i want to fill rti or recheking , what process of it . Sir bds final year rechecking ka result kb tk aayega…aur sir kaise pata chalega?? Tell me please what is the fees for filling scootny form to reacheck the copy of (BCA)Semester 5th 2019.